The face displays large roman numeral numbers with black 7″ hour and 5 1/2″ minute hands to show the time at a glance. Quartz movement runs on one AA battery. 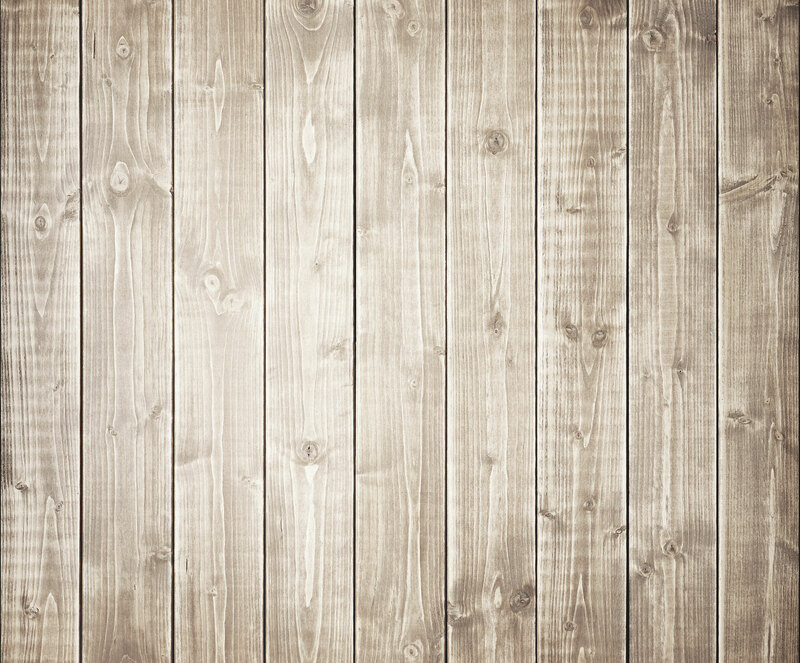 Sturdy brackets are attached to the back plate for easy hanging. 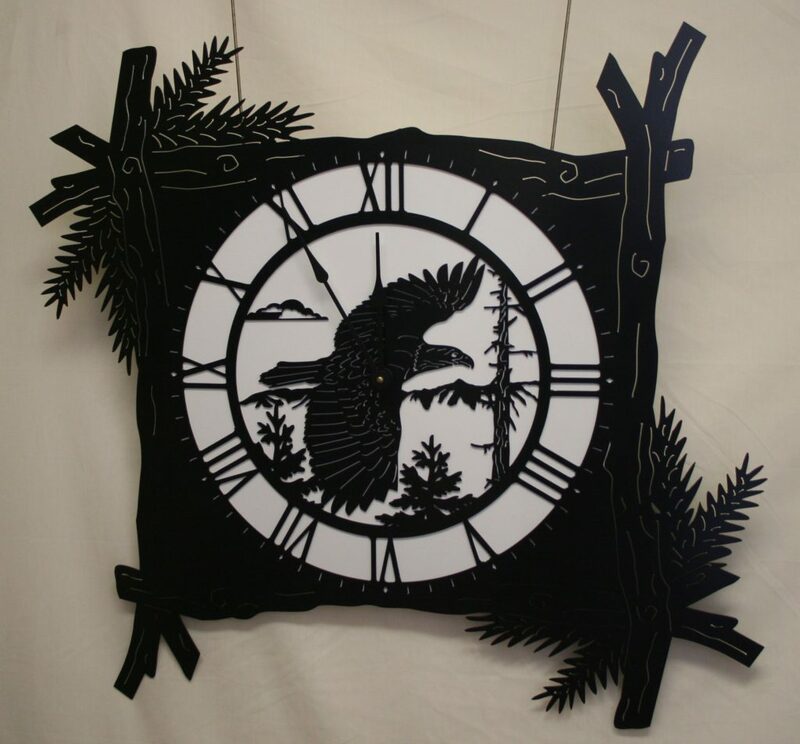 Eagle Pine Branch Clock - $102.85 (in store)Explore the tree tops with our Tree Branch Frame Clock displaying a majestic soaring Bald Eagle. The powder coat color on the face of the clock is Black Wrinkle which is an elegantly textured black with soft slate metallic shimmering undertones and matte finish and the back plate powder coat color is a crisp Bright White with a gloss finish. 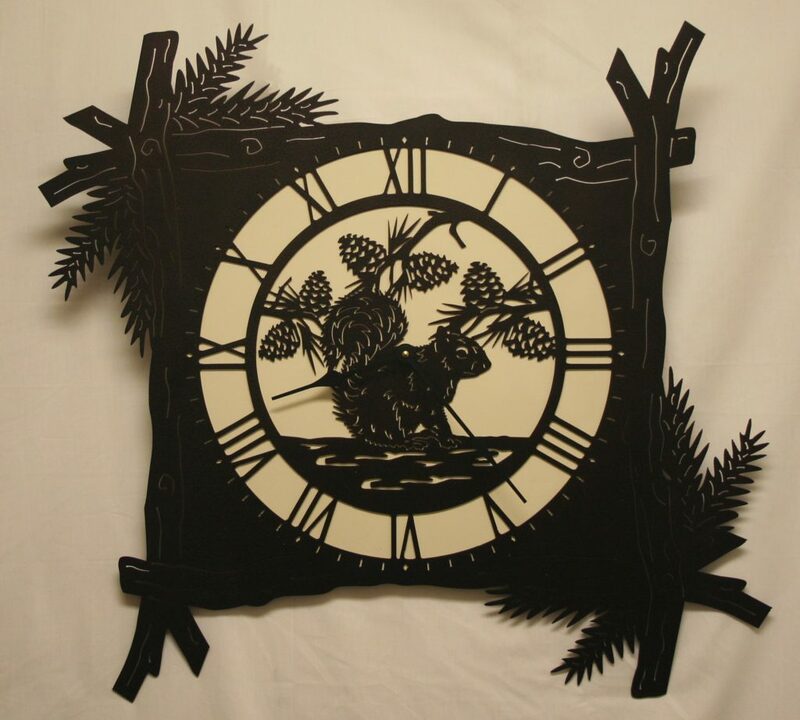 Squirrel Pine Branch Clock - $102.85 (in store)This beautiful Tree Branch Frame Clock displays a squirrel under the pine cones. The powder coat color on the face of the clock is Copper Vein which is a textured, rich deep brown with slight black undertones with a semi-gloss finish and the back plate powder coat color is a medium creamy Ivory Desert Sand with a semi-gloss finish. 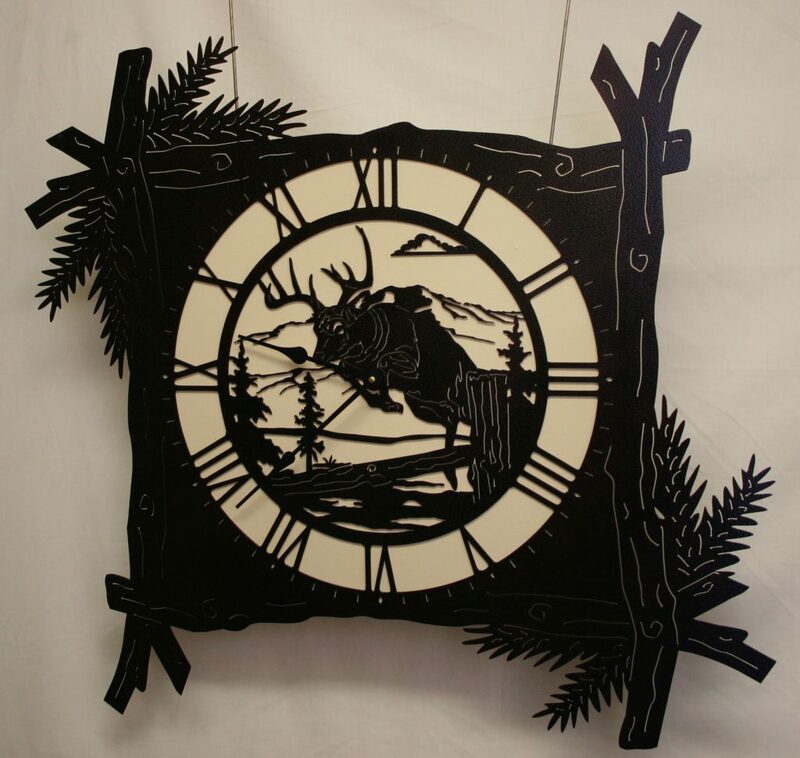 Deer Pine Branch Clock - $102.85 (in store)This beautiful Tree Branch Frame Clock displays a brawny buck jumping over a fallen log. The powder coat color on the face of the clock is Copper Vein which is a textured, rich deep brown with slight black undertones with a semi-gloss finish and the back plate powder coat color is a medium creamy Ivory Desert Sand with a semi-gloss finish. 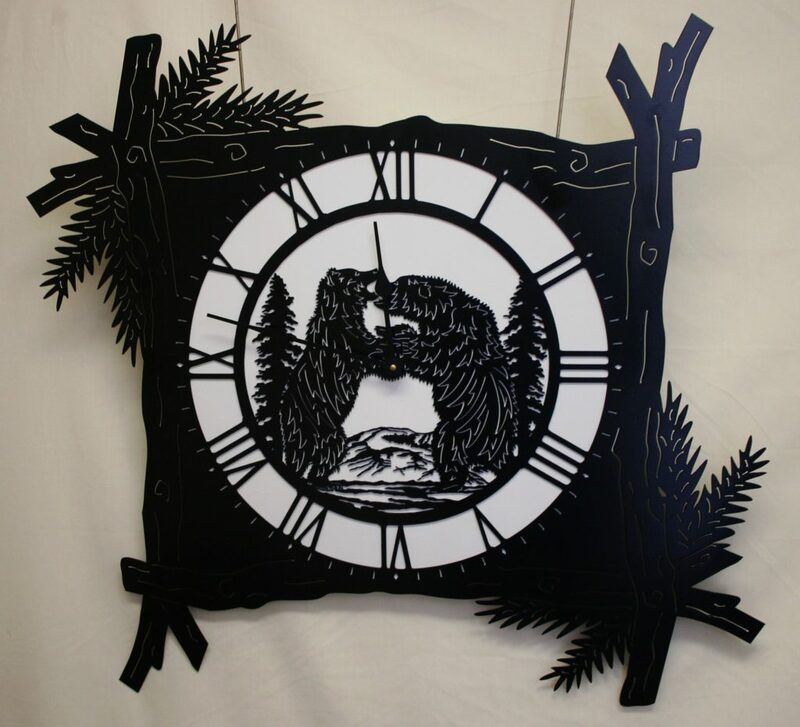 Bear Pine Branch Clock - $102.85 (in store)This beautiful Tree Branch Frame Clock displays two headstrong bear rearing up for the fight. he powder coat color on the face of the clock is Black Wrinkle which is a slightly textured deep black with a matte finish and the back plate powder coat color is Bright White with a gloss finish.